The Wat Phra Kaew (English Temple of the Emerald Buddha, Thai วัดพระแก้ว; full official name Wat Phra Sri Rattana Satsadaram, Thai วัดพระศรีรัตนศาสดาราม) is the most important Buddhist temple of Thailand. 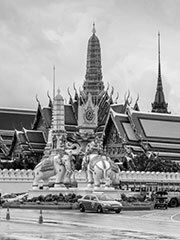 It is located in the historic center of Bangkok (district Phra Nakhon), within the grounds of the Grand Palace. The construction of the temple started when King Buddha Yodfa Chulaloke (Rama I) moved capital from Thonburi to Bangkok in 1785. Unlike other temples it does not contain living quarters for monks; rather, it has only the highly decorated holy buildings, statues, and pagodas. The main building is the central ubosoth, which houses the Emerald Buddha. Even though it is small in size it is the most important icon for Thai people. Legends hold that the statue originated in India, but it first surfaced in Chiang Rai, Thailand in 1434. It finally came to Bangkok when King Taksin fought with Laos and his general Chakri (the later King Rama I) brought it first to Thonburi. In 1784 it was moved to its current location. Despite the hot weather most of the year in Bangkok, long pants are required to enter the wat. Short pants are not allowed on men or women. This is strictly enforced. If you are of size, the facility can offer the rental of proper trouser wear.